Lisa M. Ellram, PhD, CPA, CMA, C.P.M. is the James E. Rees Distinguished Professor of Supply Chain Management at the Farmer School of Business at Miami University in Oxford, Ohio. Prior to that she spent 16 years at the Arizona State University teaching primarily MBA students in the areas of supply chain management and purchasing. 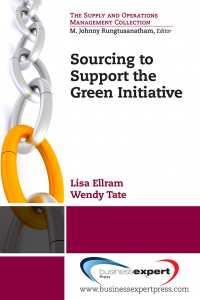 Lisa has contributed for twenty years in academia in the field of logistics and supply chain management. She has published over 100 refereed articles in top academic and managerial journals and 4 textbooks. Her focus has been on the area of cost and value management and cost control, total cost of ownership, the services supply chain, and sustainable supply chain management. She currently teaches logistics and supply chain management at both the graduate and undergraduate levels. She is also the director of the Institute for Supply Management’s A.T. Kearney Center for Strategic Supply Leadership, and Co-Editor-in-Chief of the Journal of Supply Chain Management.